The Ciate polish exploded on my shelf which had I of noticed straight away wouldn't have been so disastrous! Ciate - Wait Until Dark - I did like this polish, I have others very similar though [swatch]. ELF - Gum Pink - This went chalky and bitty [swatch]. ELF - Punk Purple - I liked this one and finished it [swatch]. ELF - Mod Mauve - The texture went all weird on this one too [swatch]. Collection - Sherbet Lemon - Never thought I would use up a yellow polish! 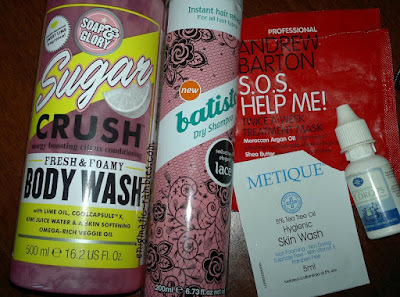 Soap and Glory - Sugar Crush - Shower Gel - I really liked the scent of this from the sugar scrub, but it didn't translate to the shower gel very well, also this was a lot thinner than other Soap and Glory shower gels. Batiste - Lace - This was alright, I wasn't a fan of the scent so won't be repurchasing this version. Andrew Barton - SOS Help Me - This was a nice treatment, although the scent was of marzipan which was a little odd in the hair. Metique - Skin Wash - Worked fine, the scent is very much tea tree oil which made me nervous using it near my eyes, but it didn't irritate them. Wilko - Eye Drops - These are great for when I am wearing contact lenses, I need to get some more of this. ELF - Tinted Moisturiser - Porcelain - I wasn't keen on the texture of this and the colour was too dark and yellow for me to use up [review]. 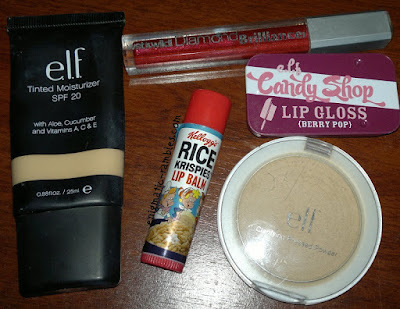 Kelloggs - Rice Krispies - Lip Balm - A nice novelty lip balm, not a repurchase though [review]. ELF - Candy Shop - Lip Gloss - Another find from the back of a draw, it went off but was nice when I had it. 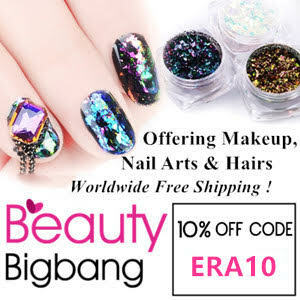 ELF don't sell this anymore [review]. ELF - Pressed Powder - Light Beige - This would have been an okay powder but light beige was too dark for me and as lightly as I go with it I always look too orange with it. While I like these I don't think I would repurchase. I like the Maybelline gel liner more. 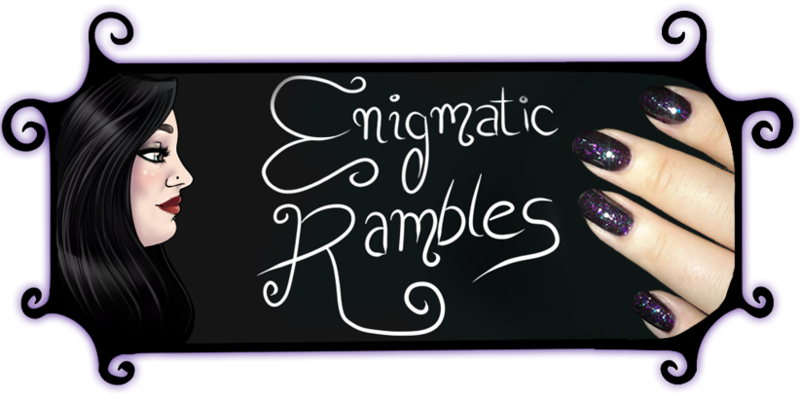 ELF - Eyeliner and Shadow Stick in Black / Smoke - Didn't like this, it creases awfully on me so won't repurchase [review]. Barry M - Kohl Pencil - This wasn't pigmented enough and was quite hard. ELF - Waterproof Eyeliner - Black - I quite liked this but it dries out quite quickly [review]. 2true Purple and Navy Eyeliners - I have no idea how long I have had these and I never reach for them any more. I used to use these a lot when I first got more in to make up. 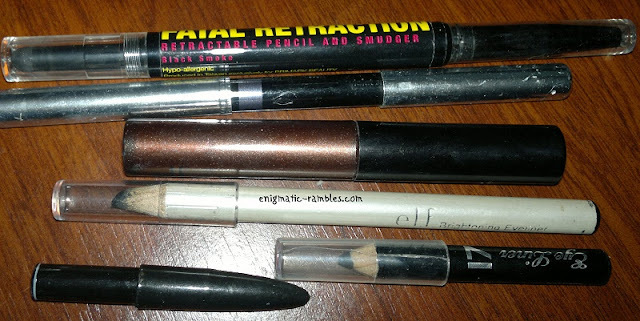 Primark - Fatal Retraction Eyeliner - I'd used this up so not sure why I had kept it, it had a smudger on one end which made for a quick eye look. 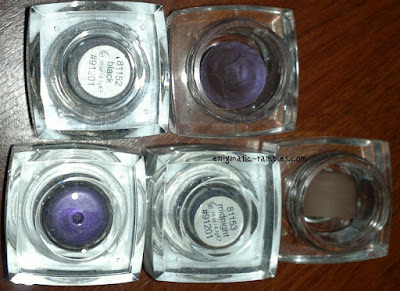 Avon - Eyeshadow and Liner - Purple - This was old, one end had a kohl liner and the other end a sponge which got eyeshadow on it from the lid. I quite liked it when I was first getting in to make up. ELF - Liquid Eyeshadow - I got this to try out a liquid eyeshadow, I didn't get on with it. Didn't blend out and creased really quickly too. ELF - Brightening Eyeliner - Black - This had dried up, it was barely pigmented and tugged the skin when I tried using it. Mini Eyeliner Kohl - These no doubt came free with something, I would have put them in my handbag but they weren't pigmented enough and were quite hard. those are a lot of empties O_O this month i did not finish any product at all so yes, definitely impressed by your list! but how can a bottle of nail polish explode?! Not sure if it was an explosion or an implosion? I think it could have been because of the heat wave we were having a few weeks ago, but it only happened to one of them so not too sure. I too was wondering how a bottle of polish could explode. You had a lot of empties/trash. Thanks for the reviews. I know, hope no others explode on me!